Divine Sheep Farm is home to some of the most adorable sheep on the planet – miniature Cheviots. Those cloven-toed little pixies are unique and divine sheep, for sure. Each has a unique personality and hardly a day goes by that something unimaginable happens and we try to catch a decent shot at it every now and then. The American Miniature Cheviot Sheep, formerly known as American Brecknock Hill Cheviot, may or may not be related to the Brecknock Hill Sheep that originated in the Brecon Beacon Hills (Brecknock & Sennybridge Hills) in Wales UK in Wales some 400 years ago. Those were only recognized in the mid 1850`s and descended from the original border Cheviots who were a very small tan faced breed which closely resembled the Olde Welsh Mountain sheep, to which in fact they were related. Early on they were crossed with both Welsh Mountain to improve wool quality, then very late in the 1850`s they again added some new blood of Leicester sheep. These crosses made the Brecknock Hill and Sennybridge sheep what they are today. 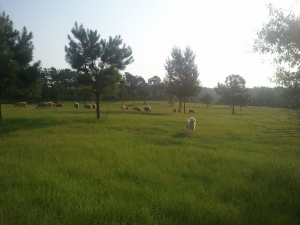 Purebred Brecknock Hill sheep come in all colors except spotted. They tend to be naturally small like their ancestors, the great majority of them 21 inches or less in height sheared. 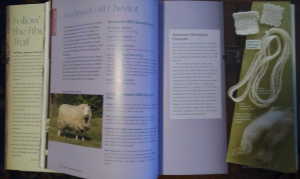 Brecknock Hill Cheviots and American Miniature Cheviot Sheep have erect ears with white face and legs and a ruff of wool behind the ears. They have no wool on the face or legs below the knee or hock. The ewes are polled and the rams are usually polled but there are occasional horned rams. Staple length is 6 to 10 cm with a fleece weight of 1.5 to 2.5 kg. The spinning count of the wool is 50’s to 56’s. The fleece has some kemp but usually no red kemp. It is used mainly for tweeds and knitwear in Britain. Their wool is wonderful for handspinning and their nature is much more gentle than the other Cheviot sheep. In Wales UK, these sheep stand alone and are not part of the three Cheviot sizes. The American Miniature Cheviot Sheep are thought to be closely related to Border Cheviots. A photo of a spring lamb from Divine Sheep Farm, a Reg. 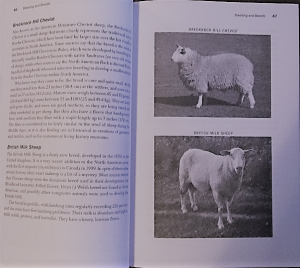 American Miniature Cheviot, represents the breed (also known as Brecknock Hill Cheviots) in Storey’s Guide to Raising Sheep. 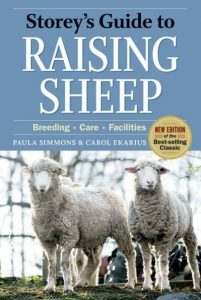 This is the perfect book for anyone that’s interested in owning or learning more about sheep. Not only is it fun to read, it’s the perfect “go to” book for situations that arise on the farm on a day to day basis. 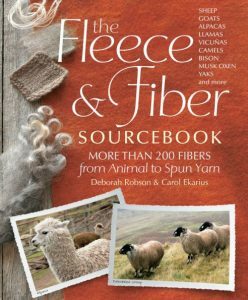 It covers everything from lambing, fencing, shearing, and just about anything imaginable. 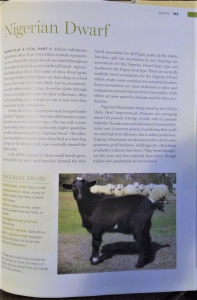 Cosmo, a very opinionated Nigerian Dwarf Goat , was featured standing guard over our Divine Sheep Farm ewes in “Sheep, Goats, Cattle, and Pigs”. 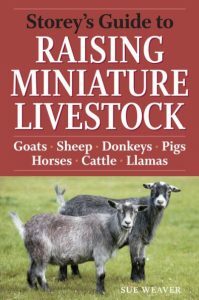 This is an adorable “coffee table” book that’s a must-have for any hobby farmer or homesteader. It’s loaded with colorful photos and is a great tool to learn about some of the unique breeds of livestock. 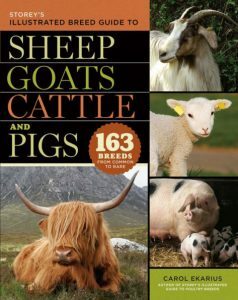 Stock from Divine Sheep Farm were used for a photo in this sweet book, also. This is such a fun book to have. It features many different breeds and gives details not frequently found elsewhere.